CDL had the opportunity to sit down with Paulo Costanzo from “Royal Pains” as he talked about his directorial debut in the episode titled “Dancing with the Devil.” Paulo stars alongside a brilliant cast in USA Network’s Royal Pains, which has been renewed for a fourth season. The show is described as being based on actual concierge medicine practices of independent doctors and companies. The show centers on Hank (Mark Feurstein) who after being wrongly blamed for a patients death, moves to the Hamptons and becomes the doctor for the rich and the famous. Paulo’s character, Evan R. Lawson, is Hank’s younger brother who is an accountant and self-appointed CFO of Hankmed. Evan is involved with Paige, the daughter of a wealthy, conservative military man. Royal Pains has become one of the highest rated shows on cable quite simply because it is on fire! What was it like to direct your cast mates you work with all the time? They were very supportive. Everybody on the crew was very aware that this was my first time. This is my first time directing anything. I’ve directed a couple short films, but I’ve never actually directed a feature or a TV show. So they all knew how big it was for me. Also, Mark was incredibly supportive because, you know, he has directed the show twice and I was so utterly supportive of him. He more than returned the favor. It was, I felt, very safe. When did you decide that you wanted to direct? I mean, did you ask to do it? I wanted to direct from like the pilot. And I put it out there and it just took time. The way it worked was Michael Rauch, the Executive Producer, he basically championed me as well as Mark. He took full responsibility for my episode. Meaning if I ran it into the ground, it would all be on his head. So it was a personal thing for him – I’m indebted to him for the rest of my life. I was wondering how you like the direction Evan’s been taking this season? It’s been a little less eventful this season. He’s been given kind of less – which was a blessing with my episode because I appeared in much less of it than other episodes. They wrote me small for it. But Evan’s been support for Paige a lot, you know, at the end of a season – which was a shift in gears that I have enjoyed. I’ve enjoyed it. It’s not that Evan hasn’t had as exciting of an arc as the previous seasons though. Seasons 2 and 3 were my favorite so far. There’s been a lot of fan talk about hoping for a Paige and Evan spin-off. Would that be something you would be open to? I don’t know. I’d have to cross that bridge. I’ve never heard of anyone saying that, but I’m going to have to think about that. What do you think it is about Royal Pains that continues to make it a fan favorite show? I think it’s very easy to watch. I think it’s true escapism. It’s beautiful – literally beautiful to look at. It brings you elements of every genre – whether it be action or comedy or drama – and it’s all wrapped up in this kind of nice package that USA seems to do so well. How do you balance acting with the technical attention to detail that directing requires? Well for me obviously this was a learning experience. Like every day I had about 100 firsts. My first day was huge – there was like a six-person dinner table scene – which for those of you who don’t know dinner table scenes are one of the more daunting things to shoot because you have to shoot – you have to do like, you know, 30 different shots around the table to make sure you get eye lines right and everything. I knew I was in for a challenge that day. And I was in it and I was in every other scene that day almost, too. What I learned very quickly is that it’s very taxing. Granted if you’ve done it a lot, I imagine it gets easier obviously. For me it was incredibly like oh my God it was so overwhelming. But at the end of each of the days where I was in a lot of it, I had a sense that my brain was about to literally just implode and shutdown. But I felt a huge sense of accomplishment because it is a lot. There are so many things going on that you have to – your mind never stops. And frankly I’m a person who thrives on that, so I actually enjoyed it. How much of you is in your character Evan? That’s a good question. So let’s see. I’d say a lot. They let me improvise a lot. I’m kind of that guy on the show. I guess I fiddle with a lot of stuff. So I kind of got the audition off of, you know, an audition where I made up like half of the audition, so I set the stage for that dynamic – which they support a lot. When did you first get the bug to direct? Did anybody like pull any pranks because it was your first time directing? Absolutely not. If anything, nobody would have in any way risked that. It’s an anxiety-ridden thing. Every director – I called about four or five of the directors that have worked on my show who I admire in preparation for the show and all of them said don’t be weirded out if you puke the night before and I was like shut up. And I swear I almost did. I was so nervous the night before because…. A lot of them still get nervous. Like people who have been doing it for 25, 30 years, and they’re like, “I still get nervous before I step on the set,” because everything hinges on you. Your vision has to be there and you have to push the ship forward or things can fall, you know. But like anything . . . anything that doesn’t kill you makes you stronger. Would you like to welcome someone from your family to the show? Who would you like to bring to the show as a guest? Who would I like to bring to the show as a guest? I would really love – and he would never do it in a million years – but I’d like Jerry Seinfeld to come on the show to play some family member of some kind. I just want to play his son so badly at some point. Maybe that’s for the future. I’ll write a special thing for that. How is directing different than what you thought it would be as compared to being on the other side of the camera? To be honest, so I’ve talked a lot about how much anxiety was involved. Once I was there, like once all the pieces were set and I had blocked the scene and, you know, I knew what the cameras were doing and I just would sit in my chair and look at the monitor, this incredible calm came over me – which is why I feel that this is kind of something I want to pursue now. This beautiful calm, this amazing feeling of calm in the midst of this storm I was like this feels so utterly comfortable and right. I didn’t expect that. I think I was just too anxious about the whole thing that I didn’t foresee an eye of the storm moment where things were just perfectly still. Growing up what director did you admire that inspired you to do it? Danny Boyle (Trainspotting), Reservoir Dogs (Quentin Tarantino), I liked Billy Wilder a lot. I was into Spielberg. I still think Spielberg’s earlier works – maybe it’s because there’s a nostalgia attached to them – like the Indiana Jones movies and Schindler’s List – those movies, you know, they were just so good I just was so overwhelmed with how good they were. I still feel that they’re great films. Denny Villeneuve. Denny Villeneuve, he’s a French-Canadian filmmaker. He directed – oh I’m so glad I thought of this. He directed a film called August 32nd on Earth – which is a small independent movie which I still feel is really beautiful and understated and has almost like a Garden State feel to it the way it was shot – and that had a big influence on me as well. Woody Allen obviously had a huge effect on me. Paul Thomas Anderson, I think I was just out of high school when Boogie Nights came out. That was a big deal for me. Outside of Royal Pains, if you could direct another television show or a movie, what genre would you like to direct? I’m trying to figure that out right now because I’m writing a feature and I’m – I don’t know. I kind of want to do a modern day Hitchcock film. I also want to do just a pure, you know, black, dark comedy. Those are two very different things. I actually have been thinking of perhaps marrying the two, but we’ll see how that goes. Obviously you don’t know what’s going to happen to Evan. But if you could write his future, what’s something that you’d really like to see happen to him? Honestly, the reason I don’t even want to go there is because if I start doing that, if I even let my mind go to what I want him to be, then I may be setting myself up for disappointment, so I kind of don’t allow it. But you’re on a Sci-Fi Web site? What’s your favorite show on television now? Right now I’m – oh well I almost feel it’s cliché to say it but Girls without any question. And by the way, that is the show that I want to be on really badly and I’m going to make that happen in the next two years hopefully. It’s the best. The sensibility is so – yes it’s so me. I feel so much like that is exactly my style. So one of the things this year our show received a huge gift in the mail and that gift was in the form of a very tall Jewish man named Ben Shenkman. 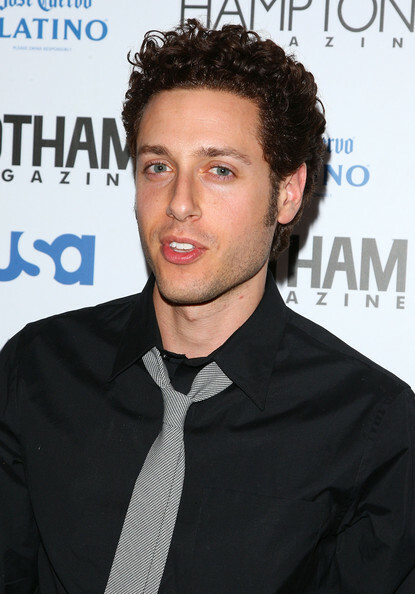 Ben Shenkman is my favorite character on the show. He’s my favorite over any other character – including my own. I think he’s so awesome and he’s such a talented actor. He was in like, you know, Angels in America, you know, a movie with Al Pacino in it. He was like he originated one of the roles in Proof on Broadway. He’s like a real – he’s an actor that I admire and he’s not – so when I got the script, I was utterly – I was so happy that I got the script that finally gave him his dues because he gets to be the hero in this episode. So I got to work with him and become closer with him. And his sense of comedy to me is genius. And the club scene – there’s two scenes – the scene in a hotel room. The one shot, so I’ll say this, in TV the directors come in and they kind of, you know, one of their jobs is to match the visual style of the show. For instance if someone’s doing Royal Pains, there’s a lot of big wide shots and, you know, beauty shots; whereas if you’re doing American Horror Story, you know, the shots are kind of off balance and off kilter and there’s a lot of weird like horror movie techniques. So there’s rarely moments for a director’s individuality to shine in TV because frankly it’s almost to their detriment if it does. If something’s conspicuously different, that’s bad. But there’s a couple of shots in this episode that I am surprised they let in the show that I am very happy and proud of and one of the shots is the shot where in the hotel room Jeremiah – she says, Patti says, “Go get my earrings. They’re on the sink,” and he goes out and he just walks through the frame and disappears and that’s an empty frame of a doorway and then he enters back to the right. And it was one of those moments. And I spoke to Michael Rauch about it where it kind of walked the line of is this Royal Pains or is this just like a weird artsy shot or this is like a Woody Allen film. And the fact that they let me keep that in there made me really happy. And I think each director that directs TV I’m learning watches the episode and goes, oh my God, that is me, like that specific moment that’s all me. Like all the rest of it is very much Royal Pains and I like fell into the mold for where it needed to be, but that one moment . . . that’s very much my style and there’s a couple of moments like that that they let me do. There’s another moment in the club where there’s this giant bouncer. This giant bouncer puts his hand on Ben’s face and like is pushing his face back. I just thought oh this would be funny and they let me do it. And I find the show’s comedy has a very distinct feel to it and that to me felt like oh this could be pushing it a little bit because me as a person I’m much, much more kind of dark and edgy when it comes to my sense of humor. But it felt good to kind of push the borders in that way. With the comedy and everything, do you guys often improve or are you very strict with like following the lines? There’s a lot of improve. I tend to be the one that usually improvises more than others just because for the most part I’ve been kind of the comic character. But yes there’s a lot of improvisation. There are a lot of lines that you hear in the show that were not in the script. And I’m going to say this. I’m just going to throw this in there as well. Joe Collins is the name of the director of photography on the show. He is the hardest working person on the show. He lights for three cameras and without him I never could have done any of it. You know, I leaned on him. He gave me suggestions. He helped me. He was like my big brother and he saved me on different occasions. And I just want to throw a big huge shout out to him because he’s superman. That’s what I call him – superman, Joe Collins. Wow, what an awesome interview. “Royal Pains” airs Wednesdays at 9pm EST on the USA network. Don’t forget to tune in to the show this week to see Paulo’s directorial debut in “Dancing With the Devil”.